Growing up I heard tales from my late father how great Tacloban port was. He told me about its importance, its physical dimensions, the location, the size of the bodegas outside it and even its relation to Gen. Douglas MacArthur. I had the idea that Tacloban was the greatest port east of Cebu and my father told me that no port in the Bicol Region compares to Tacloban port and not even his beloved Legaspi port (that was the spelling of it then before it became “Legazpi”). He told me Tacloban port will not fade because the Romualdezes were in power in Leyte and everybody knows the relation of that clan to Ferdinand Marcos then (still a President, not yet a dictator). Ironically, my father was later proven wrong not because of politics but because of a paradigm shift in shipping that he was not able to anticipate (when the intermodal trucks and buses sank Eastern Visayas shipping). So I always wondered what made Tacloban port click then. From my father, when I was still young, I got to learn what is a regional trade center, a regional capital, the importance of the two and it so happened that Tacloban happened to be both. The city by Cancabato Bay was really the dominant market east of Cebu City, bar none. My father always drilled me about cash crops and commodities and how it impacted or shall we say how it shaped shipping. He told me the government can always build ports and send ships to a port by inducement but he said if there is no cargo it won’t last as he stressed cargo makes shipping and not the other way around. Now, how many in government knows that maxim? Definitely not Gloria Macapagal Arroyo who loves “ports to nowhere” a lot! Tacloban port. Photo by Gerry Ruiz. My father was very aware of the shift of the primary cash crop from abaca to copra in the 1950’s and its impact on shipping. In high school, I saw that with my own eyes. Proud, wealthy families in our province which grew rich on abaca handicrafts and trading suddenly became more modest in living. I saw how their bodegas became empty and how the abaca workers suffered. At the same time, I also saw how busy the private port of Legaspi Oil became. Legaspi Oil, an American firm, was then the biggest copra exporter of the country. Our old man also told me about San Pablo City and how desiccated coconut and coconut oil milling made it one of our earliest cities. He also related me when I was in high school that Laguna was no longer the king of coconut. Leyte was the new lord and I understood by inference how that will boost Tacloban port, its shipping and the city itself. With PSSS (Philippine Ship Spotters Society) co-founder Gorio Belen’s research in the National Library I had more flesh of what my father was telling me when I was young. Tacloban was a great port of call in the 1960’s and 1970’s and that was visible with the frequency of ships there and the quality of its ships. Definitely it cannot match Cebu or even Iloilo but it was not far behind the latter. And to think the latter had ships calling that were still going to Zamboanga and Southern Mindanao (Cotabato, Dadiangas and Davao). Tacloban also had ships still going south to Surigao, Butuan or even Davao but it was not that many. What Tacloban had were ships calling in Catbalogan or Masbate before steaming further. There were also ships calling in Tacloban first before heading for Cebu. Entering the ’60’s, Iloilo had 10 ship calls weekly while Tacloban had 7. That was when Cagayan de Oro only had 4 ship calls per week from Manila but Butuan and Surigao both had 6 each. Won’t you wonder with those figures? Well, Cagayan de Oro only became great when it became a gateway to Southern and Central Mindanao with the improvement of the highways. That will also tell one how Tacloban, the gateway to Eastern Samar then, stacked up to other ports. Catbalogan is also not far behind because in the main the ships that called on Tacloban also called on Catbalogan first to maximize passenger and cargo volume. Catbalogan port. Photo by Joe Cardenas of PSSS. In the 1960’s, it was air-conditioning that already defined what is a luxury ship and Tacloban was among the first that had a ship with air-conditioning beginning with the MV Sweet Rose in 1967 (and she served Tacloban for long) and the MV Sweet Grace in 1970. Both were liners of Sweet Lines and they were good ships with good service (I first heard that phrase from my late father, funny). And that was when other great shipping companies still did not have that kind of ship (and that will also tell how great Sweet Lines then). Even the great port of Cebu still had plenty of ex-”FS” ships then which was the basic kind of liner then. And that will give one a view of how important Tacloban port was in those days. The MV Gen. Roxas which became the MV Sweet Rose. Philippine Herald photo. Reseach by Gorio Belen in the National Library. A little of history. Right after the war, two shipping companies fought it out in the main Eastern Visayas ports of Tacloban and Catbalogan. These two were the old shipping company Compania Maritima which was of Spanish origin and the General Shipping Company (GSC) which were formed by former World War II military aides coming from distinguished Filipino families that were part of the comprador bourgeoisie. At one time, GSC had more ships to the two ports with three while Compania Maritima only had two. Another old shipping company, the Escano Lines also fought in the Tacloban route. Unlike the two, the ships of Escano Lines still went on to Surigao and Butuan which were their stronghold. MV Leyte. Gorio Belen research in the National Library. There were some smaller shipping companies too in the route like the Philippine Sea Transport, Veloso Lines, Corominas Richards Navigation and the Royal Lines. Among the single ships that also called in the two ports were the M/S Leyte Lady and M/S Lady of Lourdes. In the mentioned shipping lines, converted “FS” and extended “F” ships were the types calling in the two ports. Among that type that served long in the route (but not continuously) was the MV Leyte of Compania Maritima and I mentioned that because that was notable. In 1955, Everett Steamship through the Philippine Steamship and Navigation Company (PSNC), a joint venture of Everett and Aboitiz entered Catbalogan and Tacloban with the quixotic route Manila-Catbalogan-Tacloban-Bislig-Davao-Dadiangas-Cebu-Manila. They used two brand-new liners alternatingly, the MV Legazpi and the MV Elcano. Those two were the first brand-new liners used solely in the local routes (to distinguish them from the big De la Rama Steamship liners that soon ended up in ocean-going routes). Gorio Belen research in the National Library. The MV Legazpi and MV Elcano were sister ships and fitted what was soon emerging as the new luxury liner class in the country (but the two were not at par with some of the luxury ships before especially the De la Rama Steamship liners which were lost in the war). If one has the money the route was a good way to tour the country and is a direct way to Southern Mindanao without going first to Cebu (because normally a passenger need to go there first from Eastern Visayas to take a connecting voyage). It was a nice route but sadly it did not last long because from the eastern seaboard route its route was shifted to the route rounding Zamboanga (I guess the reason was there was more business there and the seas were not so rough). In the early ’60s, the Philippine Pioneer Lines, a subsidiary of the Philippine President Lines (PPL) also tried the Catbalogan plus Tacloban route. When they stopped sailing, their successor shipping company Galaxy Lines continued sailing that route but they did not last long when they folded operations as a company. The two companies used ex-“FS” and ex-“AKL” ships from the US Navy. When General Shipping Company stopped local operations to go ocean-going in the mid-60s (and that provoked a break within the company), one of the companies which acquired half of their fleet and routes was the upstart Sweet Lines which was trying to follow the path of Go Thong & Company in trying be a national liner operation from a regional operations by acquiring an existing national liner shipping company which is quitting business. The other half of General Shipping fleet went to Aboitiz Shipping Company which then was revived as a shipping company separate from PSNC (and maybe the reason was the coming termination of the so-called “Parity Rights” in 1974). However, it was the PSNC that was used as the entity to re-enter the Tacloban but just using an ex-”FS” ship, the MV Carmen which came from the General Shipping Company and renamed. At this time, however, the dominant shipping company in the Tacloban and Catbalogan route/s was already Compania Maritima (it was also the biggest shipping company then in the Philippines) after their main rival General Shipping exited the local shipping scene. The company had three ships assigned there, two of which were ex-”FS” ships including the aforementioned MV Leyte. The year 1967 marked a change in the Tacloban and Catbalogan route. For the second time after the short-lived fielding of the luxury liners of PSNC the route had luxury liners again and two were competing against each other. The notable thing was they both came from General Shipping and both were local-builds by NASSCO (National Shipyards and Steel Corp., the current Herma Shipyard) in Mariveles, Bataan. These were the former second MV General Roxas which became the MV Sweet Rose and the former second General Del Pilar which became the third MV Mactan of Compania Maritima. However, the two were not fast cruiser liners. This category was already multiplying in the country with the fielding of the 17.5-knot brand-new cruisers of Negros Navigation Company, the MV Dona Florentina in 1965 and the MV Don Julio in 1967. This was preceded by the MV President Quezon of the Philippine President Lines which later became the MV Galaxy of Galaxy Lines which was first fielded in 1962. A note, however, the earlier MV Don Julio of Ledesma Lines which was an overpowered (by putting a submarine engine) ex-”FS” ship can also be classified as a fast cruiser liner and it also served the Leyte route shortly as the MV Pioneer Leyte of Philippine Pioneer Lines. The earlier MV Don Julio which became the MV Pioneer Leyte. Gorio Belen research in the National Library. In this tight market, a small shipping company serving Bicol and Northern Samar also tried a Catbalogan and Tacloban route. This was the Rodrigueza Shipping Corporation which was already feeling the effects of the Philippine National Railways in Bicol regarding the movement of cargo. However, two Chinoy shipping companies that will dominate Philippine shipping in a decade-and-a-half’s time were still not represented in the route. The two were William Lines and Sulpicio Lines (which was not yet existent then). The mother company of Sulpicio Lines which was Carlos A. Gothong & Co. was also not in this route at this time. They will come in two years time, however, with the fielding of the first MV Don Enrique which was a lengthened former “FS” ship. You know they tended to start quietly. Many ex-”FS” ships or even smaller ships were battling in the Catbalogan and Tacloban routes after 1967. Many will battle for there is cargo and copra was so strong then (exports to the US, Japan and Germany when we had 44% share of the world’s exports) not only in Tacloban but also in a way in Catbalogan which was synonymous with fishing before overfishing caught up with them. In this era, imported rice does not yet go direct to the provincial ports and Eastern Visayas is a rice-deficit region and Cotabato and other parts of the country sends rice to it through trans-shipment. Many other grocery and hardware items also come from Manila to the region as Eastern Visayas was not an industrial region. In the luxury liner category, however, the MV Sweet Rose of Sweet Lines and the MV Mactan of Compania Maritima started their battle. This was actually a very even battle because the two were sister ships but the third MV Mactan was faster at 16 knots to the 13.5 knots of the MV Sweet Rose because she was fitted with a bigger engine. Compania Maritima fielded the MV Mactan here because the MV Sweet Rose was overpowering their MV Leyte which was just a lengthened ex-”FS” ship. In a few years, however, the MV Mactan will sink in a storm and MV Leyte will come back in the Eastern Visayas routes. Leading into the next decade, the 1970’s produced significant changes. Aboitiz Shipping Corporation, the successor to PSNC abandoned their Catbalogan and Tacloban routes and just concentrated in Western and Southern Leyte which was their origin (it had lots of copra too). Morever, the rising William Lines was already present and two successor companies of Go Thong & Company, the Sulpicio Lines and Carlos A. Gothong Lines+Lozenzo Shipping Corporation (two shipping companies with combined operations before their split in 1979) were also plying the Catbalogan and Tacloban routes but they were just using ex-”FS” ships. The old partner of Aboitiz Shipping Corporation before the war, the Escano Lines also left Tacloban but maintained Catbalogan as a port of call as long as their MV Rajah Suliman was still capable of sailing. In the stead of the lost minor shipping lines of the region like Veloso Lines, some minor shipping companies were also doing the route. Among them were N&S Lines and NORCAMCO Lines which were actually Bicol and Northern Samar shipping companies. The two were looking for routes near their turf because of lost passengers and cargo from the opening up of the Maharlika Highway. Well, although Maharlika Highway was not yet fully paved, the trucks were beginning to roll to Bicol and maybe somehow they have already seen the handwriting on the wall. Rodrigueza Shipping, also a Bicol shipping company stopped sailing the route. Soon, however, Sulpicio Lines upped the ante and fielded a liner with size, air-conditioning and service that will challenge the MV Sweet Rose and MV Mactan. This was the MV Dona Angelina which was a former refrigerated cargo ship in Europe. That type of ship, when converted here as a passenger-cargo ship will automatically have the availability of refrigeration and air-conditioning. At 13.5 knots design speed, she can match the pace of the MV Sweet Rose but not of the MV Mactan. The MV Dona Angelina was the second ship of Sulpicio Lines in the route. In response, Sweet Lines brought in their former flagship into the route, the MV Sweet Grace which was acquired brand-new from West Germany in 1968. She has the speed of 15.5 knots but she was not bigger than MV Dona Angelina or even the MV Dona Vicente (that later became the MV Palawan Princess) which was assigned also to the route. Competition was really heating up in 1974 and I remember this year was the peaking of copra prices just before its great fall. Things were really heated up because next year Sulpicio Lines brought in their new flagship MV Don Sulpicio on its way to Cebu which means a Manila-Catbalogan-Tacloban-Cebu route. Can you imagine that? If former flagship and current flagship will battle in this route then that means Tacloban and Catbalogan were very important ports then. And to think the later well-regarded MV Dona Vicenta also practically debuted on that route. Well, copra was still then a very important crop. In fact it was our primary cash crop then. By the way, the flagship MV Don Sulpicio was the later infamous MV Dona Paz and she came from Tacloban and Catbalogan on her last voyage. In the heat of this competition, it was actually the old dominant Compania Maritima that was wilting. Their MV Mactan foundered in 1973 and there was no good replacement available and so the old ship MV Leyte was left shouldering alone and she was already badly outgunned by the ships of Sulpicio Lines and Sweet Lines. In the 1970’s there was no way a former “FS” ships can match the new liners that came from Europe. They simply were bigger, faster and had more amenities. When the MV Don Sulpicio was assigned the exclusive Manila-Cebu route to join the two-way battle there of MV Cebu City and MV Sweet Faith, the good MV Dona Vicenta replaced her in the route and teamed up with the MV Dona Angelina. In 1976, however, William Lines fielded a very worthy challenger, the namesake of Tacloban which was the MV Tacloban City and she held the Catbalogan and Tacloban route for a long, long time. At 17.5 knots design speed she can match the best of Sulpicio Lines and Sweet Lines. Aside from speed she can also match in size, accommodation and service. And so in this year several ships that can be classified as luxury lines were battling in the route. That was an indication how important was that route. As a note, however, the MV Sweet Grace was reassigned by Sweet Lines to other routes especially since their luxury liner MV Sweet Home was no longer reliable. Meanwhile, the shrinking former nationally dominant Compania Maritima no longer fielded a second ship since they were already lacking ships because they no longer acquired a ship since 1970 despite a rash of hull losses. In 1979, the death knell of Catbalogan and Tacloban ports was sounded clear although few realized it at that time for there was no concept of intermodal shipping before. This was the fielding of MV Cardinal Ferry I of Cardinal Shipping to span the San Juanico Strait and buses and trucks to and from Manila immediately rolled the new highways of Samar and Leyte. By this time copra as the primary cash and export crop of the country was already receding fast in importance because the export market was already shrinking due to the rise of what is called as substitute oils like corn oil, canola oil and sunflower oil. It was not Catbalogan and Tacloban which were first swamped by paradigm changes but the other ports of Samar like Laoang, Victoria and Calbayog (which I will discuss in another as these ports are more connected to Bicol and Masbate). The fall of Catbalogan and Tacloban ports will happen much later when copra has almost lost its importance. This was also the time that Manila oil mills has already been sidelined too by the rise of new oil mills in the provinces (and the government actually promoted that). Although sliding now, for a time it looked like Tacloban and Catbalogan ports will hold on to the onslaught of the intermodal. One reason for that was in the crisis decade of the 1980’s it was the Top 2 Sulpicio Lines and William Lines that were still battling there and for sure none of the two will budge an inch. That was the decade when so many shipping companies quit business altogether (and that was most of our liner companies) and actually no shipping company was left unscathed. In the late 1980’s, Carlos A. Gothong Lines Inc. (CAGLI) made a comeback in national liner shipping but it did not enter Tacloban or Catbalogan. Instead, they called on the Western Leyte ports of Palompon, Isabel and Ormoc before proceeding to Cebu and it was actually a very successful route for them. Also, the Madrigal Steamship came back to passenger shipping with good luxury liner cruisers (which were already obsolescent as it was already the time of ROROs or Roll-on, Roll-off ships) and it had a Manila-Romblon-Catbalogan-Tacloban route. However, this was not a long plus to Eastern Visayas liner shipping because in the early ’90s the venerable Sweet Lines and Escano Lines quit passenger shipping and although the latter still had cargo ships their presence were already receding in the region. And then the Madrigal Steamship did just last a few years and quit their passenger shipping also. There were no other entrants in this period to the region except just before the end of the millennium when the MBRS Lines of Romblon, seeking new routes entered the San Isidro port in Northern Samar. However, they also did not last long. When the “Great Merger”which produced the shipping company WG&A happened in 1996, they did not add a new ship and just altered two routes a little. Actually, what happened is they even pulled out a ferry from Carlos A. Gothong Lines and just left one which was mainly the MV Our Lady of Sacred Heart (WG&A is a shipping company which changed route assignment every now and then). However, one of their ships which was passed on to their regional subsidiary Cebu Ferries Corporation (CFC) tried a Manila-Ormoc-Nasipit route using the MV Our Lady of Akita 2 which was the former MV Maynilad. Although successful, she did not last long because she grounded in Canigao Channel and was never repaired. The last two liners to serve Catbalogan and Tacloban were the MV Masbate Uno of William Lines and WG&A and the MV Tacloban Princess of Sulpicio Lines which had identical routes. The MV Cebu Princess also spelled the latter ship when she was down for repairs. When the MV Masbate Uno left as the the MV Our Lady of Manaoag of Cebu Ferries Corporation she was briefly replaced by the MV Our Lady of Naju in the Tacloban route. Photo by John Cabanillas of PSSS. In a short time, however, the Aboitiz Transport System (ATS) which was the successor to WG&A also abandoned their Western Leyte routes too. However, for a time ATS came back and served Ormoc with the Manila-Romblon-Ormoc-Cebu route using the MV St. Anthony of Padua but that did not last long. Now there are no more liners to Eastern Visayas and only oldtimers remember when its ports and shipping were still great. What the millennials know now are the intermodal buses and the so-many trucks in the many ports of Allen, Northern Samar. Times have changed. The paradigm changed, too. Nowadays, those four liners of the defunct but once great Compania Maritima will no longer ring a bell to most people. Even in the years when the four were still sailing those were not among the best or the primary liners of the said shipping line except for the MV Mindanao which was actually the second ship to carry that name in Compania Maritima. And so what was the significance then of their losses? This I will try to explain. The shipping company Compania Maritima of the Philippines (as there were other shipping companies of that name abroad and even in Spain, the country of origin of our Compania Maritima) was the biggest in local passenger shipping from probably the late Spanish era and until just before the company folded sometime in 1984 at the peak of the political and economic crisis besetting the country then. And so, the company had a run at the top of our passenger shipping field for nearly a century and that is probably a record that can no longer be broken. Compania Maritima in English means “Maritime Company”. When the Pacific War ended and the shipping companies were still struggling to get back on its feet they were dependent on the war surplus ships that were being handed down by the Americans. Although Compania Maritima was also a recipient of these kind of ships their rise was not dependent on it as they were capable of acquiring surplus ships from Europe using their Spanish connections (the owners of the company, the Fernandez Hermanos were dual Filipino and Spanish citizens). Their contemporaries Madrigal Shipping and Manila Steamship (the Elizalde shipping company) were also capable of that (now who remembers those two shipping companies?) but their acquisitions were old ships that I suspect were castoffs from convoy duty during the war. In comparison, Compania Maritima’s ships from Europe were just a few years old. Right off the bat, Compania Maritima had the biggest passenger fleet in local shipping after the war and their best ships were the biggest ferries in the Liberation and post-Liberation years. Aside from their war-surplus ex-”C1-M-AV1” ships which were refrigerated cargo ships during the war, Compania Maritima had ships whose origins were as liners in Europe and it definitely has a difference over passenger ships whose origins were as cargo ships. Among the ships from Europe was their first flagship, the MV Cebu and the sister ships MV Panay and MV Jolo. The latter two were fast cruiser ships of that early Republic shipping years. Locally, it was almost always that Compania Maritima will have the best and biggest ships and the biggest fleet. They were also among the first to order brand-new liners like the MV Luzon in 1959, the MV Visayas in 1963 and the MV Filipinas in 1968. When the three were fielded those ships were not only the biggest but also the best (as compared to the ex-”C1-M-AV1” and the ex-”C1A” types which were big but not really that luxurious). Not included in this comparison were liners whose main function were as oceangoing liners. Among these are the brand-new ships of De la Rama Steamship which were leased from the government that later will become the subject of a dispute in court. A ship bigger than the three mentioned was the MV Mindanao of the company which came in 1970 from Europe but was not a brand-new ship having been built in 1959. But her distinction when she was fielded was she was the biggest liner sailing then and even bigger than the flagship MV Filipinas. It was only in December 1979 when her record length will be broken when the MV Dona Virginia came to William Lines. The MV Mindanao was the last-ever passenger-cargo ship acquired by Compania Maritima and the 1970’s was the decade when they will lose a lot of ships as casualties of typhoons. Some will sink, some will capsize and some will be wrecked. Now those three categories are all different in the determination of the loss of a ship. Not all ship losses actually result in the disappearance of the ship below water. In “wrecking” the ship will still be above water in some beach. In “capsizing”, there are many cases when part of the ship can still be above water or just below the waterline, visible and accessible. But many times also the ship will be in deep waters and so that is called “capsizing and sinking”. If the hull is holed or broke into two it will simply be “sinking”. The MV Leyte was a small passenger-cargo ship, technically a multi-day liner but by no means a luxury liner as she was just a former “FS” cargo ship during the war which was converted for passenger-cargo use. As a passenger-cargo ship, her career evolved mainly in serving her namesake island and province through the port of Tacloban in a route extending up to Butuan and Nasipit. There are times though when she also substituted in other routes outside Leyte. The ship was originally known as USS FS-386 in the US Army. This small ship came to Compania Maritima in 1947. Although 53.9 meters in length over-all and 560 gross register tons this ship was lengthened to 66.2 meters with a gross register tonnage of 730 tons. Lengthening of ex-”FS” ships was common then (most were actually lengthened) in order to increase their passenger and cargo capacities. The speed of this type of ship was between 10 and 11 knots and their accommodations were rather spartan. The MV Guimaras was not a small liner for her time with a length over-all of 98.6 meters, a gross register tonnage of 3,555 tons and a net register of 1,868 tons. Translated to more modern measurements that is approximately the dimensions of the fast cruiser liners of William Lines of the 1970’s. She actually had the dimensions of the sank MV Cebu City and MV Don Juan which were both flagships but her breadth was one meter wider. It is hard to compare her with the ROPAXes of today as this type have greater beams than the cruiser ships of old and these are generally taller. The “fatter” MV Don Claudio is actually a nearer match but still the breadth of the MV Guimaras was bigger. The MV Guimaras was actually bigger than the flagships of the other shipping companies of her era. The MV Guimaras was one of the former liners from Europe that came here in the 1960’s to bolster our fleets when surplus ships from the war were no longer available in the market. It was not only Compania Maritima which took this route but also Carlos A. Gothong & Company (the yet-undivided company), William Lines and Sweet Lines. These ferries from Europe actually averaged 100 meters in length over-all and that will give an approximate idea of their size (gross register tonnage is sometimes a subjective measure). On the average their speed was about 15 knots but the speed of the MV Guimaras tops that at 16.5 knots. The MV Guimaras was the former refrigerated cargo ship Sidi-Aich of the Societe Generale des Transports Maritimes a Vapeur (SGTM) of Marseilles, France and she was completed in 1957 and so when she came she was not yet an old ship. The route of the MV Guimaras from the time she was fielded until she lost was the Manila-Iloilo-Cotabato route although at times she also dropped anchor too in Zamboanga port which was just on the way. The MV Dadiangas was a bigger ship than the MV Guimaras but built in the same year and also in France where she was known as the Kitala of the Compagnie Maritime des Chargeurs Reunis. Like the MV Guimaras she was also a refrigerated cargo ship with passengers and the advantage of this type is air-conditioning and refrigeration is available from the start and so they can be refitted as luxury liners. This ship was 109.5 meters in length over-all with a gross register tonnage, the cubic volume of 4,143 tons and a net register tonnage of 3,240 tons. For comparison, this ship is already the size of the MV Dipolog Princess and MV Iloilo Princess, both of which reached the new millennium. She came to Compania Maritima in 1969 and her first name in the company was MV Isla Verde. She was subsequently renamed to MV Dadiangas in 1976. Like the biggest ships of Compania Maritima, the MV Isla Verde also spent part of her career on overseas routes. When she was sailing the local seas her route was to Dadiangas (a.k.a. General Santos City) and Davao. In the later part of her career she was paired with the MV Leyte Gulf of the company in the same route. She is also a relatively fast ship for her time at 16 knots. A summer Signal No. 3 typhoon of 150-kph center wind strength, the Typhoon “Atang” caught the MV Leyte on a voyage from Manila and she was wrecked in the southwestern portion of Sibuyan island trying to reach shelter, the usual predicament then of ships without radars during the storms of those times. The MV Leyte was almost on a collision course with the oncoming typhoon and so she actually preceded the fate of the MV Princess of the Stars in almost the same area 30 years later. The ship met her sad fate on April 20, 1978. Meanwhile, the MV Guimaras was caught by the twin storms Typhoon “Etang” and Typhoon “Gening” which intensified the habagat waves and created a storm surge. The MV Guimaras was driven ashore on July 7, 1979 a kilometer south of Turtle Island in Campomanes Bay in Sipalay, Negros Occidental. She could have been trying to reach port as Sipalay has a port or she might have been trying to seek shelter in the bay. And on July 18 of that same year she was officially abandoned. The wreck of MV Guimaras is still there today in shallow waters of about 20 feet and is already a dive site. According to a website, the wreck of the MV Guimaras is already broken now. In studying maritime losses one lesson that can be gained is it is not a good idea to try to outrun a typhoon or even a tropical storm (the modern terminology if the center wind is below 120kph). This is what MV Dadiangas tried to do when she passed the eastern seaboard of Mindanao on the way back to Manila from Davao. A tropical storm, the Typhoon “Huaning” was also on its way to Surigao and Leyte but was still then at some distance and still weak. But sea disturbance is not confined to within the walls of the typhoon and so the MV Dadiangas ran aground and was wrecked in Siargao island and to think the maximum strength of the typhoon as it was called then was only 95kph. MV Dadiangas was wrecked on June 23, 1980 and was broken up in 1981. Three lost ships that at first look do not have that much significance. But then the big MV Mindanao of the company was also broken up in 1980. What does it matter here now in the annals of Philippine passenger shipping? In the closing years of the 1970’s especially in 1978, Compania Maritima, William Lines and Sulpicio Lines were already at near-parity with each other in fleet size and quality especially after the slew of purchases of fast cruisers liners of William Lines and Sulpicio Lines. Meanwhile, Compania Maritima was no longer buying ferries after 1970 and in the 1970’s the company had a lot of ship losses. That means a net decrease for their passenger-cargo fleet while the passenger fleets of her main competitors were getting bigger. It has long been my wonder if Compania Maritima was ever overtaken as the local Number 1 before their demise. Upon further peering it seems with the consecutive losses of the MV Leyte, MV Guimaras and MV Dadiangas and the scrapping of the MV Mindanao was the tipping point in the relative parity of the three companies. After that the two Chinoy shipping companies were already ahead by a little. 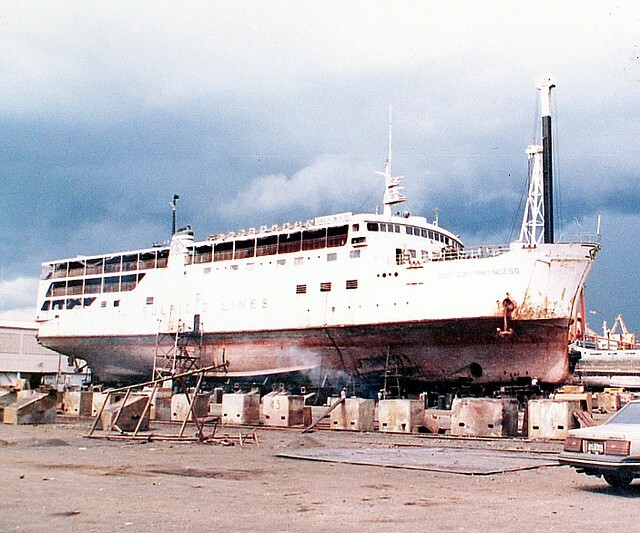 The acquisition of William Lines of their new flagship MV Dona Virginia in December 1979 and of the MV Philippine Princess by Sulpicio Lines in 1981 plus their good salvage job on the burned MV Don Sulpicio which became the MV Dona Paz in 1981 were the final additions that pushed William Lines and Sulpicio Lines clearly ahead of Compania Maritima and that was epoch-making as the run on the top of Compania Maritima after nearly a century was finally broken. And to think Sulpicio Lines also lost their MV Dona Paulina in a wrecking in Canigao Island on May 21, 1980 and their old MV Don Manuel had a non-fatal collision on the same year. By 1981 Compania Maritima only had 3 original liners (the MV Filipinas, MV Luzon and MV Visayas) plus one former refrigerated cargo ship from Europe (the MV Leyte Gulf) and one former ”C1-M-AV1” ship (the MV Samar) plus a few ex-”FS” ships that were not all in passenger service. By that year, William Lines had 6 fast cruiser liners already (the MV Cebu City, MV Misamis Occidental, MV Manila City, MV Cagayan de Oro City, MV Ozamis City and the MV Tacloban City) plus a former refrigerated ship from Europe (the MV Davao City) and 10 ex-”FS” ships in liner and overnight routes. Meanwhile, Sulpicio Lines had 5 fast cruiser liners already (the MV Philippine Princess, MV Don Enrique, Don MV Don Eusebio, MV Dona Paz and MV Dona Marilyn) plus 2 former refrigerated cargo ships from Europe (the MV Dona Angelina and MV Dona Helene), 4 other ships from Europe (the MV Dona Vicenta, MV Don Camilo, MV Dona Gloria and the MV Dona Julieta), the Don Ricardo and MV Don Carlos which were from Japan, the ex-”FS” ships Don Victoriano I and the MV Don Alfredo, the MV Dona Lily from Australia which was the size of an “FS” ship plus the local builds MV Ethel and MV Jeanette. On the balance, in 1981 Sulpicio Lines might already have a very slight pull over William Lines which was a very great comeback from the split of Carlos A. Gothong & Co. in 1972. To repeat, even without the MV Dona Virginia and the MV Philippine Princess, the two Chinoy shipping lines were already ahead of Compania Maritima. And if the Compania Maritima, William Lines and Sulpicio Lines had rough parity in 1978 what probably tipped the balance were the three lost ships of Compania Maritima and the breaking-up of MV Mindanao in 1980. Four lost liners without replacements. And that is the problem of losing ships and not buying replacements. 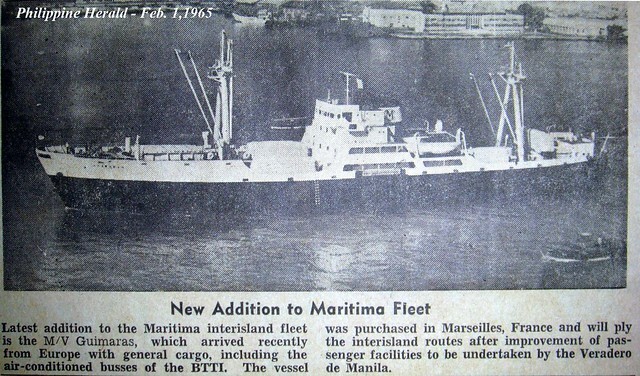 From 1981 it was no longer just a matter of passenger-cargo ships as container ships were already taking a large chunk of the liner business (and in this type William Lines and Sulpicio Lines joined the race against early pacesetter Aboitiz Shipping Corporation while Compania Maritima did not). So actually by 1983, William Lines and Sulpicio Lines were running even less liners as some old and small ships were either laid up, sold or converted to just carrying cargo. In 1982, the MV Samar was broken up and in 1983 the MV Luzon was also broken up. Compania Maritima was already near extinction then. It was just the dying dance and after that it was already a battle between William Lines and Sulpicio Lines which is Number 1. Among the local liner shipping companies before, it was Sulpicio Lines which was known for an almost unvarying schedules and routes. For nearly 15 years until they were suspended from sailing by MARINA (Maritime Industry Authority) because of the capsizing of the MV Princess of the Stars off Sibuyan Island, their schedules were almost the same. The only significant change was when the MV Princess of Unity arrived in the country in 1999 and Sulpicio Lines created an entirely new route for her, the Manila-Cebu-Davao-Dadiangas (General Santos City) route. But this route was permanently gone in 2005. For a time, Sulpicio Lines also gave MV Manila Princess a route similar to the MV Maynilad (Manila-Zamboanga-Davao route). But she did not last as they can never make it engines reliable enough. With an unvarying route, Sulpicio Lines does not need to advertise in the national and local papers unlike her main competitor WG&A Philippines (later the Aboitiz Transport System or ATS) which always changed assignments and schedules. Passengers know which day there is a Sulpicio ship in their area and what is the hour of departure. They just go to the port as Sulpicio Lines does not practice the online booking system. The only failure would be then was if the scheduled ship is on drydock. However, if a suitable reserve ship is available, Sulpicio Lines will still run the route and schedule. And that was one of the functions of their MV Manila Princess then, to relieve ships going to the drydock. The queen route of Sulpicio Lines was the Manila-Cebu route. This was the route where they field their flagship and that runs twice a week (so that means plenty of interport hours for the ship). Many of her passengers are still bound to the other islands including Mindanao and so they still transfer ships. Some of them do after shopping in SM Cebu or in Colon. Or some leave their belongings somewhere and go to Carbon Market. SM Cebu, Colon and Carbon are all just near Cebu port. Conversely, some of the passengers of the ship going to Manila are from the other islands including Mindanao. Cebu Port is actually a great connecting port. In a hub-and-spoke model, Cebu Port is the hub and the routes emanating from her as the spokes. In these nearly 15 years, three ships served as the flagship holding the Manila-Cebu route. The first was the MV Princess of the Orient starting in 1993 when she arrived in the country. She replaced the old flagship which was the MV Filipina Princess. However, on 1998, Princess of the Orient sank in a storm off the coast of Cavite. The MV Princess of the Universe then replaced her on the route and she held the route until 2004 when MV Princess of the Stars arrived. Going back to a more distant past, it was in 1975 when Sulpicio Lines adopted an exclusive Manila-Cebu route in the mold of MV Sweet Faith and MV Cebu City when it fielded the MV Don Sulpicio came (this ship was more known by her latter name – MV Dona Paz of the sinking infamy). When MV Don Sulpicio was hit by a fire while sailing (and beached), the MV Dona Ana replaced her on the route (this ship was also more known by her latter name – MV Dona Marilyn of the foundering infamy near Maripipi island). When the MV Philippine Princess arrived in 1981 she took over the Manila-Cebu route until MV Filipina Princess displaced her in 1988. The next most important route for Sulpicio Lines in this period was the route held by the MV Princess of Paradise, the fastest liner in the country for about a decade or so. She held the Cagayan de Oro route and she sails to that port twice a week. One was a direct voyage and only taking 25 hours for the 512-nautical mile route. On the way back to Manila, she calls on Cebu. Her next voyage in the same week will be a one that will call first in Cebu and Nasipit before going to Cagayan de Oro. From Cagayan de Oro she will do a direct voyage to Manila. The third most important route for the company during this time was the Manila-Cebu-Surigao-Davao route held by the big and former flagship MV Filipina Princess. This route has rough waters during the ‘amihan’ (the northeast monsoon) but it seems with her sailing ability she was just fit for this route. Being just run once a week she has long lay-overs in Cebu Port especially on her way back to Manila where she stays overnight. These long lay-overs was one of the characteristics of Sulpicio Lines and passengers appreciate this because they are given time to visit relatives and to shop. As for me, I welcome it as it gives me a chance for “free tourism” (as I don’t have to spend to reach the place and if I am already tired and sweaty I can go back to the ship and partake of its free meals, too). The next most important route of Sulpicio Lines after this was the weekly Manila-Iloilo-Zamboanga-Dadiangas route, a route that does not pass through Cebu but nevertheless calling on three regional centers of trade and commerce. In the Philippines, the routes passing through Iloilo are the next most important after the routes passing through Cebu. Three ships held this route for Sulpicio Lines. The first was the MV Princess of the Pacific. After she grounded on an islet off Antique in 2004 which resulted in comprehensive total loss (CTL), she was replaced by the MV Princess of the World. Later, when she was destroyed by fire the MV Princess of the South held this route. Except for MV Princess of the World, in terms of size, these ships were already a notch below the ships that served the first three routes, an indication of the relative difference of the central routes via Cebu and the western routes via Iloilo. Their speed too is also no longer in the 20-knot range of the ships in the first three routes (except MV Princess of the World). After the four come the relatively minor ships and routes of Sulpicio Lines (although the route held by MV Cotabato Princess does not look minor). And I will start first with that. MV Cotabato Princess held the Manila-Estancia-Iloilo-Zamboanga-Cotabato route. Actually, the liners from Manila does not dock in Cotabato Port which is a shallow river port. Instead, they dock in Polloc Port in Parang, Maguindanao, a significant distance away. This route has long lay-overs, too. Since there are plenty of marang, durian and lanzones in Zamboanga, enterprising passengers will bring in those fruits and sell to the passengers while sailing. It will be sold out by the time the ship is docking in Manila. So that there will be no restrictions they will also give the crew and the captain their shares. Estancia, meanwhile, is known for its abundant fish supply. The next most important route after this was the weekly Manila-Dumaguete-Ozamis-Cebu route. Upon reaching Ozamis, the ship still goes to Cebu and comes back the same day in the evening after the arrival. In this way, the Sulpicio Lines ship also serves as a Visayas-Mindanao overnight ship but she has only a few passengers in this role. Since this route was a chopped version of the former route that still calls on Cagayan de Oro (dropped when MV Princess of Paradise arrived), she has two overnight lay-overs in Dumaguete which was nice. Adventurous passengers use that chance to roam the famous Dumaguete Boulevard. Two Sulpicio ferries served this route. The first was the old flagship MV Philippine Princess. When she burned in 1997 (in a drydock), the MV Princess of the Caribbean replaced her. Both ships are cruisers. I do not know the next most important route of Sulpicio Lines. All were weekly and all seems not to be priority routes. Here, the older and lesser ships of Sulpicio Lines were concentrated. I might start with the near-parallel route of where MV Princess of Caribbean served. Incidentally, they depart Manila simultaneously. The ship on this route was the MV Dipolog Princess and from Manila it goes first to Tagbilaran, then Dipolog (actually Dapitan) before proceeding to Iligan and Cebu and she will retrace the route. Like the MV Princess of Caribbean she was also assigned an overnight Visayas-Mindanao route. She has even less passengers in this role. She has also long lay-overs but not overnight ones. This ship and route functioned as the ride of the Bol-anons in Lanao to their home province. This was not actually a strong route as the voyage takes too long and the ship was no longer at par with the good standards of the era. Many in Lanao just take the ferry to Cagayan de Oro and take the bus. That was also true for passengers from Manila. I would rather next discuss the route to Palawan before discussing the routes that hook eastward. Sulpicio Lines has also the route to Puerto Princesa via Coron. It was the MV Iloilo Princess that was assigned there. But if there is a vacancy in the other routes, the ship has the tendency to leave Palawan and substitute. MV Iloilo Princess was also not that reliable as her engines were balky and I heard that only one chief engineer, the most senior, had a good feel for her engines. When MV Iloilo Princess burned in a shipyard in 2003 there was no replacement on the route any longer. The next route was a route that has permanence. It was the “longest” route in the company which means it had the most ports of call, a type which was a remnant of the routes of the past when express liners were just few, the roads were still bad and shipping companies try to call on most ports possible for increased revenues. This was the Manila-Masbate-Calubian-Baybay-Maasin-Surigao route. This was even the chopped version (it was up to Butuan in the old past) so it might be a surprise to some. Calubian was a port of call because of the emotional attachment of the owners to it (they started somewhere near there) although it has lost all significance. The MV Palawan Princess mainly held this route after she was displaced in the route to Ozamis. It had no airconditioned accommodations and the general arrangement plan was much like an ex-FS ship although she was bigger. She was the oldest liner then (not really a liner but a passenger-cargo ship). Her alternate was the much better MV Surigao Princess. But she cannot hold the route for long because of problematic engines. Too bad because though small her accommodations are up to Suite level (what a contrast with MV Palawan Princess). MV Surigao Princess was gone in 2003 when she was broken up. The next route and ship were remarkable because they were able to hold on to the route when her era was already over because of the coming of the intermodal transport. The route was the Manila-Masbate-Ormoc-Cebu route. No, you can’t buy a Manila-Cebu ticket for this ship. You would have to pay extra for the Ormoc-Cebu leg which functions as an overnight route (in the MV Princess of the Caribbean and MV Dipolog Princess one can’t also ask for a ticket up to Cebu from Manila). There were long lay-overs too in Masbate and Ormoc. Even when the intermodal was already ruling, the MV Cebu Princess still soldiered on in this route because Sulpicio Lines simply won’t send ships to breakers as long as it was still capable of sailing. The last liner route of Sulpicio Lines was a route that changed, was cropped within the period I am discussing (the other I mentioned that were cropped were cropped before this period). This was the route of the MV Tacloban Princess. Originally, she had a twice weekly route to Tacloban with one of that passing by Catbalogan. But with the loss of passengers and cargo to the buses and trucks, they dropped Catbalogan. For a time she even stopped sailing the Tacloban route (just too many buses here and also trucks especially trucks going back to Manila looking for a load). There was a time Sulpicio Lines combined her route with the route of MV Cebu Princess. Sulpicio Lines simply does not give up on a route and area. And that characteristic was the one lost by Philippine shipping (and that was irreplaceable) when they went out of ferry business because the other competitor was known for dropping routes in a minute because bean counters ruled there. Aside from these liner routes, Sulpicio Lines also had dedicated overnight ferry routes and ships. For the Cebu-Cagayan de Oro overnight route they used two ships. The first was the MV Cagayan Princess. But when the competition heated up in this route they fielded the new liner MV Princess of the Ocean. After she was assigned there, nobody can outgun Sulpicio Lines in the Cebu-Cagayan de Oro overnight route in size and speed (well, even in the prestigious and premier Manila-Cebu route, Sulpicio Lines does not want to be outmatched). And for the Cebu-Nasipit overnight ferry route, they have the MV Nasipit Princess at the start. But she does not sail in most days as its engines were really bad. When MV Princess of the Ocean was assigned in the Cagayan de Oro overnight route, the MV Cagayan Princess was assigned the primary duty in the Nasipit overnight route. In 2005 the MV Princess of the Earth came and she relieved the MV Cagayan Princess which was then brought to a new route, the overnight ferry route to Naval, Biliran. The Nasipit (Butuan in Sulpicio Lines parlance) overnight ferry route was one overnight route that Sulpicio Lines dominated in this era as the competition was inconsistent (sometimes there were ships, sometimes there were none). In 2008, Sulpicio Lines was suspended from sailing in the aftermath of the MV Princess of the Stars tragedy. Three ferries, the MV Cebu Princess, the MV Cagayan Princess and the MV Tacloban City were sold off immediately to raise cash (and I knew then that the routes that hooks eastward and the most threatened by the intermodal will be finally lost). A few ships were allowed to sail thereafter but MV Cotabato Princess quit soon. Meanwhile the Sulpicio Lines fleet languished in Mactan Channel. One by one the laid-up ships were sold to the breakers starting with the MV Princess of Paradise and MV Palawan Princess. This was followed by the MV Cotabato Princess. I guess they were trying to raise cash for settlement and other expenses by these disposals and also to amass cash for the purchase of new cargo ships. They had then two ships sailing, the MV Princess of the South which was holding the Manila-Cebu route and the MV Princess of the Earth which was sailing the Cebu-Cagayan de Oro route with a diversion to Nasipit twice a week. There were five ships then in Mactan Channel and in their wharf in Pier 7 in Mandaue. These were the MV Princess of the Universe, the MV Filipina Princess, the MV Princess of the Ocean, the MV Princess of the Caribbean and the MV Dipolog Princess. It is as if Sulpicio Lines was still waiting for a favorable turn of events in the greatest crisis of their company when public opinion was very much against them. But in one fell swoop they sold the five laid-up ships to the breakers. Maybe for emotional reasons the departures happened in the night. Laid up three years those ships already deteriorated especially they were in sea water. Every year not used the budget needed to get them going again mounts. And the hope that the government and MARINA will relent on restrictions seemed to have evaporated. Being politicians, they would rather feed off on uninformed public opinion. Having no understanding of the maritime industry, they did not know they were killing the already threatened liner sector. Along this time PSACC (Philippine Span Asia Carrier Corporation – the new name of Sulpicio Lines) reached the decision to just concentrate on container shipping. In 2014, Sulpicio Lines sold their last two ferries, the MV Princess of the Earth and lastly, the MV Princess of the South. Now they are gone from passenger shipping. And when PSACC had already sold their last liners, MARINA withdrew their passenger license. Funny. Ironic but the government is now encouraging entrants to this sector. But definitely there would be no takers as the viability of liners has changed and they have killed the most interested and most loyal shipping company in this sector. As the saying goes, “The medicine was too strong that it killed the horse”. That is what they did to Sulpicio Lines. The company will still survive in cargo shipping but the dedicated sea passengers have no more liners to sail with. Sad. In the 1960’s, Carlos A. Go Thong & Co., as it was known then. was able to latch their sail to a new commodity crop that will soon rise as the Number 1 commodity crop in the Philippines. That commodity crop was copra and its downstream product coconut oil. In the world this was the decade when coconut oil will displace animal oil (lard) as the primary cooking oil. The Philippines will become the Number 2 producer of copra in the world and the Number 1 exporter. Lu Do and Lu Ym will become the biggest aggregator of copra in the Philippines in that decade and its partnership with Go Thong and its subsidiary for international routes Universal Shipping with bring the two to the highest of heights in the trade of this commodity crop. Go Thong will have many small ships with small passenger capacities or even none plying distant and out-of the way ports to load copra all over the Visayas and Mindanao. In many ports where they load copra, Go Thong will usually have big bodegas just for copra. In Iligan City, it was big as a city block and right there near the port and part of the city proper. All these copra will go to Lu Do and Lu Ym in Cebu and a portion of it will be milled into coconut oil, both crude coconut oil and refined coconut oil (this is what we buy from the supermarket and stores). The coconut oil and copra (mainly the latter) will be loaded in Universal Shipping vessels to be shipped to Europe (mainly West Germany) and the Far East. Other tankers, both foreign and local will also load coconut oil in the Lu Do and Lu Ym jetty in Cebu that is now partially enclosed by the SRP road. Along the way with this trading in Europe, Go Thong was able to meet a broker or agent that promised them ten used European cargo-passenger ships that can be used in Philippine waters. In the middle of the 1960’s there was already a need for new liners in the inter-island routes as the population has already increased, the economy has already grown since 1945 and Mindanao was undergoing fast colonization (hence there was a need for ships to load people and cargo). At this time there were no more available former “FS”, former “Y”, former “F”, former PT boats and minesweepers and former “C1-M-AV1” ships from the US. Japan has no great supply yet of surplus ships as they were still in need of them to fuel their economic boom which was called the “Japan miracle”, their process of rising from the ashes of World War II to a great economic power of the world. It was only Europe that can provide the liners we needed then in the mid-1960’s. These ten passenger-cargo ships for Go Thong along with a few local acquisitions and one from Japan vaulted a shipping company that was relatively late in the liner scene (they became a liner company only in 1954 with the launching of the lengthened ex-”F” ship Dona Conchita) to Number 1 in the very early 1970’s. They overtook the erstwhile leader Compania Maritima which was already then steadily losing ships through maritime accidents in what seemed to be a death wish. Aboitiz Shipping Corporation was then in the process of taking over the Philippine Steam Navigation Company (PSNC), their partnership with Everett Steamship. It had as many ships approximately but most of those were ex-”FS” ships whose size and quality cannot match with the new ships of Go Thong from Europe. Some of those have airconditioning and refrigeration because they were once refrigerated passenger-cargo ships in Europe and those were generally faster. Aboitiz Shipping through Everett Steamship had three good ships ordered new from Japan in 1955, the Legazpi, Elcano and Cagayan de Oro but Go Thong had more ships with airconditioning especially since they were able to acquire the former Gov. B. Lopez from the defunct Southern Lines which became the first Dona Ana. The Gothong which was acquired from Cie Cherifienne d’Armament in 1963 whose first name was Cap Gris Nez. Later she was known as the Dona Pamela. She was built by Solvesborgs Varvs & Reden in Solvesborgs, Sweden in 1950. She measured 88.8 meters by 12.4 meters with a Gross Register Tonnage of 2,347 tons and Net Register Tonnage of 1,272 tons after modification. Her Deadweight Tonnage was 2,317 tons. She was powered with a single Atlas engine which gave her a top speed of 14 knots when new. Take note the US war-surplus ships usually ran only at 11 knots. She went to the fleet of Sulpicio Lines Inc. after the break-up in 1972. The first Don Sulpicio which was acquired from Rederi A/B Samba in 1964 whose original name was the Colombia. Later she was known as Dona Gloria. She was built by Ekensberg in Stockholm, Sweden in 1947. Her measurements were 85.9 meters by 11.6 meters by 10.0 meters. The ship’s Gross Register Tonnage was 1,759 tons with a Net Register Tonnage of 1,079 tons. The Deadweight Tonnage was 2,235 tons. She was powered by a single Atlas engine of 2,000 horsepower which gave her a top speed of 13 knots when still new. She went to the fleet of Sulpicio Lines Inc. after the break-up. The Tayabas Bay which was acquired from Liberian Navigation Company SA in 1965 which was first known as the Tekla. Later she was known as the Don Arsenio. She was built by Helsingor Vaerft in Elsinore, Denmark in 1945. She measured 110.0 meters by 14.0 meters by 8.7 meters with a Gross Register Tonnage of 2,306 tons and her Deadweight Tonnage was 4,197 tons. She was powered by a single Helsingors Jernskib engine which gave her a top speed of 14.5 knots when new. This ship was first used in the international routes. She went to the fleet of Carlos A. Gothong Lines Inc. after the break-up. In 1966, two big sister ships came which were used in the international routes. These were war-surplus former US ships but acquired from European owners. The Manila Bay, a sister ship of Subic Bay which acquired from from A/S J. Ludwig Mowinckels Rederi in 1966 was first known in Cape Pillar in the US Navy is a Type” C1-A” cargo used used for convoy duty during World War II. She was built by Pennsylvania Shipyard in Beaumont, Texas, USA. Her measurements were 125.7 meters by 8.3 meters and her Gross Register Tonnage was 5,158 tons and her Deadweight Tonnage was 6,440 tons. She was powered by a single Westinghouse engine of 4,000 horsepower which was good for 14 knots when new. This ship was bigger and faster than the Type “C1-M-AV1” ships of which the other local shipping companies have in their fleet then. She was broken up in 1973. The Subic Bay, the sister ship of Manila Bay was acquired from O. Lorentzen in 1966. She was first known as the Cape St. George in the US Navy fleet and like Manila Bay she was built by Pennsylvania Shipyard in Beaumont, USA but in the year 1942. She had the same external measurements as Manila Bay but her Gross Register Tonnage was a little lower at 5,105 tons and but her Deadweight Tonnage was the same. She had the same powerplant and top speed as the Manila Bay. She was broken up in 1973. The Dona Rita which was acquired from Cie de Nav Mixte in 1967 was first known as the Tafna. She was built by Lorient Arsenal in Lorient, France in 1949. She measured 95.3 meters by 14.0 meters and she had a Gross Register Tonnage of 2,063 tons and her Deadweight Tonnage was 2,147 tons. She had just a single engine but her top speed when new was 15 knots. She went to the fleet of Lorenzo Shipping Corporation after the break-up in 1972. The Dona Helene which was acquired from Cie Generale Transatlantique in 1968 was originally known as the ship Atlas. Later she was known as the Don Alberto. She was built in 1950 by the Chantiers et Ateliers de Provence in Port de Bouc, France. She measured 95.4 meters by 14.0 meters by 8.5 meters and her Gross Register Tonnage was 2,317 tons. Her Net Register Tonnage was 957 tons and her Deadweight Tonnage was 2,267 tons. She also had a single engine, a 3,000-horsepower Sulzer and her top speed when knew was 13 knots. She went to the fleet of Sulpicio Lines Inc. after the break-up. In that same year 1968, two sister ships were acquired from Norddeutscher Lloyd. The Don Lorenzo which was acquired from Norddeutscher Lloyd in 1968 and was first known as the Liebenstein and was a sister ship of Don Camilo. Later she was known as the Dona Julieta. She was built in 1951 by Bremer Vulkan in Vegesack, West Germany. Her measurements were 105.1 meters by 14.2 meters by 8.7 meters. The ship’s Gross Register Tonnage was 2,353 tons, her Net Register Tonnage was 1,275 tons and her Deadweight Tonnage was 3,175 tons. She carried 411 passengers. The Don Lorenzo was powered by a single Bremer Vulkan engine of 3,800 horsepower and she was fast at 16 knots top speed when new. She went to the fleet of Sulpicio Lines Inc. after the break-up. The Don Camilo was also acquired from Norddeutscher Lloyd in 1968 and was first known as the Liechtenstein. She was the sister ship of Don Lorenzo which was also known as Dona Julieta. She was also built in 1951 by Bremer Vulkan in Vegesack, West Germany. She had the same external measurements as her sister ship. Likewise, their dimensional measurements – GRT, NRT and DWT were also the same. She had the same 3,800-horsepower Bremer Vulkan engine which was good for a fast 16 knots when new. This speed was the same as the luxury liners then running the inter-island water. She went to the fleet of Sulpicio Lines Inc. after the break-up. The second Don Sulpicio was acquired from H/f Eimskipafelag Islands in 1969. She was first known as the Dettifoss and she was a refrigerated passenger-cargo ship and hence she had refrigeration and airconditioning and was a modified version of a luxury ship. She was in effect the flagship of the company from 1969 to 1975 when the third Don Sulpicio came and she became known as the Don Carlos Gothong. She was built in 1949 by Burmeister & Wein (yes, the B&W) in Copenhagen, Denmark. She measured 94.6 meters by 14.0 meters and her Gross Register Tonnage was 2,918 tons and her Deadweight Tonnage was 2,700 tons. She was powered by a single B&W engine and her top speed was fast at 16 knots when new. She went to the fleet of Sulpicio Lines Inc. after the break-up. In 1972, one more ship arrived from Europe which became the Dona Angelina. She was the former Touggourt from Cie de Nav Mixter like the like the Dona Rita. She was also built by Provence in Port de Bouc in 1950. Her measurements were 91.4 meters by 14.0 meters and her Gross Register Tonnage was 2,696 with a Net Register Tonnage of 1,600. Her Deadweight Tonnage is 2,269. She had a Loire engine of 3,000 horsepower that gave her a design speed of 13.5 knots. Dona Angelina went to Sulpicio Lines after the break-up in 1972. Now, i don’t know why the total is 11. Maybe Dona Angelina is not part of the ten-ship deal as she came three years later than that burst in 1963 to 1969. All were bigger and faster than ex-”FS” ships, even those lengthened ones and they were generally in the size of the former “C1-M-AV1” ships but faster. In this period, Go Thong also acquired other ships from local sources. They took over the former Dona Aurora of the Maritime Company of the Philippines (the international line of Compania Maritima) in 1965 and she became the Sarangani Bay. She was used in the international routes like when she was under the Maritime Company of the Philippines. In 1966, Go Thong acquired the Gov. B. Lopez from Southern Lines, the only luxury liner of their fleet and which has airconditioning and refrigeration. This became the first Dona Ana. This ship was a local-built by NASSCO in Mariveles, Bataan and she went to Lorenzo Shipping Corporation after the break-up. Also in 1966, Go Thong acquired the Don Amando from Northern Lines. This was the former Tomokawa Maru from Japan built by Kawasaki Shipbuilding Corporation in Kobe, Japan. In the Go Thong fleet, she was first known as the Dona Hortencia before she became known as the Dona Paz (this is an earlier Dona Paz and not the infamous Dona Paz which was formerly the Himeyuri Maru) in the fleet of Carlos A. Gothong Lines Inc.
A grand total of 15 ship additions from 1963 to 1972 and actually 14 from 1963 to 1969, probably the fastest addition of liners in Philippine shipping history! Including minor ships in out-of-the-way routes, by 1972 Go Thong had already a fleet of more than 30 vessels including cargo ships with more than 20 of those being passenger-cargo ships. This was the biggest fleet then with more than the total of Aboitiz Shipping Corporation and PSNC which only had over 20 vessels. Actually, even in 1970, the start of the new decade they already had the biggest fleet in the inter-island waters. Not included in the comparison was the bigger Philippine President Lines which was in ocean-going routes and its rise was fueled by something else. 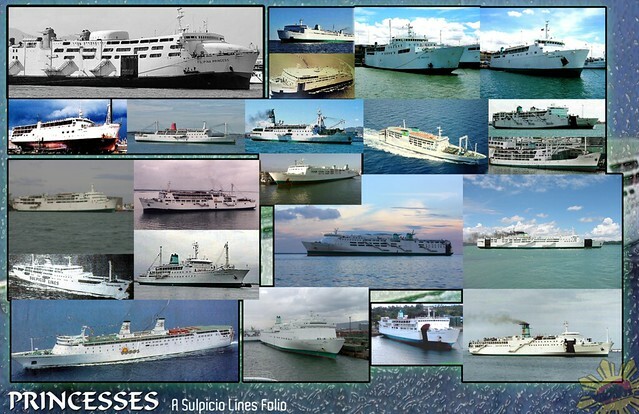 In the split of 1972, 16 ships went to the new Sulpicio Lines Inc. Most of these were liners and it included 6 of those 10 ships (two, the Manila Bay and Subic Bay might have been retained by Universal Shipping until their break-up). Compania Maritima had a grand total of 19 ships in 1972. Even with the split, Sulpicio Lines Inc. started with still one of the biggest fleet in the country at probably third rank in grand total. They did not start at the bottom (and will soon rise to Number 1 again). That was the rise of Go Thong then which was real fast by any measure. If people think flagships or famous former flagships fare better than the rest of their fleet, well, don’t be too fast in conclusions. Empirical evidence might not support that and these tales might make you wonder and think. This selection is limited to post-World War II ferries. This is also limited to liner shipping companies and the bigger regional shipping companies. For the latter, I limited it to flagships at the moment they were lost. The Mayon was the flagship of the recomposed fleet of the Manila Steamship Company Inc. after World War II. She was the second ship acquired by the company after World War II (she is a different ship from the prewar Mayon of Manila Steamship Co.). The first was not really acquired but returned. That was the Anakan which was a prewar ship of the company that fell into Japanese hands during World War II and pressed into the military effort on their side. It was fortunate to survive the Allied campaign against Japanese shipping during the war. When the war ended and Japanese ships were surrendered she was returned by the Allies to the company in 1945. The Mayon was built as the Carabobo in 1923 by the New York Shipbuilding in Camden, New Jersey, USA for the Atlantic and Caribbean Shipping and Navigation of Delaware, USA. In 1938, she was sold to the Northland Transportation Company of Alaska, USA. In 1946, Manila Steamship Co. which was also known as the Elizalde y Compania acquired this ship and she was fielded in the Manila-Iloilo-Pulupandan route of the company. Originally classified as a refrigerated passenger/cargo ship, she had luxurious accommodation because that meant airconditioning and cold drinks were available and those treats were rare in that era. With cabins and lounges, she was considered a luxury liner of her days. However, on a charter voyage from Jakarta to Manila on February 18, 1955, an explosion and fire hit her and she was beached off the western coast of Borneo island. This incident so shook up Manila Steamship Co. that they withdrew from shipping the same year and they sold all their vessels to other companies except for the very old Bisayas, the former Kvichak which was sold to the breakers. Most of the these sold ships were former “FS” ships. Manila Steamship Co. never went back again to shipping. Elizalde y Compania was one of the biggest companies in the Philippines then and its founder Manuel Elizalde Sr. was one of the richest men in the Philippines during that time and he was known as a financial backer of presidential candidates. This was the first Dona Conchita that was the first flagship of Carlos A. Go Thong & Co. when they were first able to acquire a Manila route after they bought out the Pan-Oriental Shipping Company of the Quisumbing family. The ship was named after the wife of the founder of the company and this was a legendary ship during her time. The ship was actually not an ex-”FS” ship as many thought. She is actually a former “F” ship that was lengthened by National Steel and Shipbuilding Corporation (NASSCO) in Mariveles, Bataan. Her origin was actually as a sank ship by a storm off Cavite that was bought cheap and salvaged by Carlos A. Go Thong & Co. and re-engined for she had no engines. Her replacement engines were a pair of Gray Marine diesels with nearly double the horsepower of the ex-”FS” ships and so instead of running at only 11 knots she was capable of 16 knots and thus she was able to claim as being the fastest in the Manila-Cebu route then. This ship then did various routes for the Carlos A. Go Thong & Co. but always her first port of call from Manila was Cebu before proceeding to other ports. During those years there were no dedicated Manila-Cebu ships only (that came during the era of the fast cruisers starting in 1970 with the Sweet Faith of Sweet Lines). Because of that once, a week sailing was the norm then except for the very long routes (i.e. Davao) and the very short routes (i.e. Capiz, Mindoro, Romblon). When the Dona Conchita got older sometimes she was not sailing. I heard her Gray Marine engines were not that durable compared to the General Motors engines of the ex-”FS” ships. Then on one of her voyages, she caught fire off Mindoro sometime in 1976 or thereabouts. There was no precise way of confirming the dates or exact location as she does not have an IMO Number and therefore she was not in the international maritime databases. In 1971, Negros Navigation Company brought out their best and biggest liner yet, the M/ S Don Juan. The ship was named in honor of Don Juan L. Ledesma, eldest child of Don Julio and Dona Florentina Ledesma, one of the founders of Negros Navigation. M/S Don Juan was a brand-new ship built by Niigata Engineering Company, Ltd. in Niigata, Japan for P13,650,000 from a design of Filipino naval architects. She was the fifth-built brand-new liner of Negros Navigation Company after the Princess of Negros (1962), the Dona Florentina (1965), the beautiful Don Julio (1967) and Don Vicente (1969). This luxury liner became the new flagship of Negros Navigation Company and she was used in the Iloilo and Bacolod routes of the company from Manila. She was fast at 19 knots and she brought an end to the reign of MV Galaxy as the speediest ship in the Manila-Iloilo route. However, on one voyage from Manila to Bacolod she was struck on the portside by the tanker Tacloban City of the Philippine National Oil Company on the night of April 22, 1980 near the island of Maestre de Campo in Tablas Strait. Such collision proved fatal for the ship and she listed immediately and went down fast. The confirmed number of dead was 121 even though the tanker immediately tried to rescue the passengers of M/S Don Juan and even as other vessels in the vicinity tried to help in the rescue effort too. It is thought many of the dead were passengers of the cabins trapped by buckled doors and those injured by the impact. This incident triggered a mourning in Bacolod as most of the passengers who perished hailed from that place. The wreck of the ship lies in deep waters estimated to be some 550 meters and so salvage and/or recovery is out of question as far as local resources is concerned. Maybe the RORO ferry Santa Maria, acquired by Negros Navigation Company in 1980 was the replacement of the ill-fated M/S Don Juan. But I am not sure if she was considered a flagship of the company. The MV Cebu City of William Lines Incorporated was a sister ship of the M/S Don Juan of Negros Navigation Company. She was also built by Niigata Engineering Company Ltd. in Niigata, Japan but her date of build (DOB) was 1972. Having a slightly bigger engine she was slightly faster than her sister since she can do 20 knots. Maybe they purposely ordered a bigger engine so she can battle in speed her would-be main rival, the Sweet Faith of Sweet Lines Incorporated in the prime Manila-Cebu route. Sweet Faith was the fastest liner then in the Philippines since her fielding in 1970. The battles of Cebu City and Sweet Faith both made them legends in Philippine shipping and remembered decades after they duked it out. MV Cebu City was the second brand-new ship of William Lines Inc. after the MV Misamis Occidental and she was the flagship of William Lines Inc. from 1972. As the flagship, MV Cebu City exclusively did the Manila-Cebu route twice a week and so followed the pattern set by Sweet Faith. She was the flagship of the company up to the end of 1979 when the new flagship of the company arrived, the equally legendary Dona Virginia which was also involved in another tight battle with another flagship, the Philippine Princess of Sulpicio Lines Inc. After she was displaced as the flagship MV Cebu City sailed various routes for the company. On the night before the morning of December 2, 1994, while hurrying after a late departure from Manila North Harbor, MV Cebu City encountered the MV Kota Suria, a container ship of Pacific International Lines (PIL) near the mouth of Manila Bay before reaching Corregidor island. On a collision course, the Kota Suria asked for the customary port-to-port evasion maneuver. However, MV Cebu City turned to port because maybe she was intending to “tuck in” near the coast, a practice of smaller ships when near then Cavite coast to save on running time. Maybe MV Cebu City thought she had enough clearance but they might have misjudged the speed of the MV Kota Suria. She was rammed by the much bigger MV Kota Suria on the starboard side which caused her to list and to capsize and sink in a short time. About 145 people lost their lives in that collision. The Philippine Coast Guard later held that MV Cebu City was mainly at fault but Philippine authorities also detained MV Kota Suria (but she later escaped). The wreck of MV Cebu City now lies under about 25 meters of water. The world-infamous Dona Paz was born as the Himeyuri Maru of the Ryukyu Kaiun KK (the RKK Line). She was built by Onomichi Zosen in Onomichi yard in Japan in 1963 and she plied the Okinawa route. In 1975, she was sold to Sulpicio Lines Incorporated. She was refitted and remodelled for Philippine use with the primary intention of increasing her passenger capacity. In Sulpicio Lines, she was renamed as the Don Sulpicio and she was the new flagship of the company starting in 1975. As the flagship of Sulpicio Lines, Don Sulpicio did the Manila-Cebu route exclusively twice a week. This was the first time Sulpicio Lines did this exclusive assignment and that was following the footsteps of Sweet Lines and William Lines which had flagships doing the Manila-Cebu exclusively. On one voyage in this route on June 7, 1979, she caught fire and she was beached in Maricaban island at the edge of the mouth of Batangas Bay. Her whole superstructure and cargo holds were consumed by the fire. Against expectation Sulpicio Lines had her repaired but the repairs took nearly two years. Meanwhile the Dona Ana, the later Dona Marilyn took over as flagship of the company and did the Manila-Cebu route until the new flagship of Sulpicio Lines arrived, the Philippine Princess. After repairs, in her refielding in 1981, Don Sulpicio was already known as the Dona Paz. Maybe the renaming was done to avoid reference to her previous tragedy. There were also changes in her superstructure after the repair. After her refielding, the Dona Paz was assigned to the Manila-Tacloban and Manila-Catbalogan-Tacloban routes of Sulpicio Lines. However, on one voyage from Tacloban and Catbalogan she was involved in a collision with the tanker Vector on the night of December 20, 1987. The fuel of the tanker exploded and both vessels were engulfed in fire. There were only 26 survivors in the collision and there was a claimed 4,386 dead and that was affirmed by the clueless and out-of-jurisdiction Supreme Court. That was big enough to place the Dona Paz as the worst peacetime maritime tragedy in the whole world. However, the official casualty according to the Board of Marine Inquiry placed the number of dead at only 1,565 but that was what can be only counted and might be an underestimation too. The casualty figure was clearly bloated because the Governor of Northern Samar then, Raul Daza had people sign up claims against the company and the number from his province was about 2,200. That was an impossibility since passengers from that province going to Manila generally take the bus already and that was cheaper and faster. Going to Catbalogan is actually going farther and the limited number of buses then going from Catarman to Catbalogan can only take hundreds at most. It was clearly a con game by the Governor in a scheme to bilk Sulpicio Lines. Imagine a passenger total greater than those from Leyte and Western Samar when the ship did not dock in Northern Samar! The ship was clearly overloaded but the casualty figure was really artificially bloated. Much later the Supreme Court completely absolved Sulpicio Lines from liability in the tragedy. It was on a technicality because Vector had an expired license when it sailed. The Dona Paz wreck lies between Marinduque and Dumali Point of Mindoro near the town of Pola. The distance of it from Marinduque is twice its distance from Mindoro. The Dona Marilyn was the first known as the Dona Ana in Sulpicio Lines Incorporated and she is actually a sister ship of Dona Paz. She arrived in 1976 for Sulpicio Lines and they were the first fast luxury cruiser liners of the company and so they were advertised by Sulpicio Lines as the “Big Two”. As mentioned before, as Dona Ana she replaced the then Don Sulpicio as the flagship when it caught fire in 1979 and she fulfilled that role until the Philippine Princess arrived in 1981. The Dona Marilyn was born as the Otohime Maru in Japan. She was also built by Onomichi Zosen for Ryukyu Kaiun KK (the RKK Line) in 1966 for the Okinawa route. When she was sold to Sulpicio Lines in 1976 there was no change of flagship designation although she is the newer and ship. She was instead fielded in the Manila-Cebu-Davao express route of the company. Maybe she was sent to that more stressful (for the engines) route because she had the newer engines. Incidentally, the engines of the two sister ships were identical but Dona Ana was rated faster than Don Sulpicio and that might be the second reason why she was assigned the long Davao route. In 1980, the ship was renamed as the Dona Marilyn. In 1981 when the new Philippine Princess arrived she was assigned not assigned again her old Davao route because Sulpicio Lines had two new fast cruisers that came in 1978 and one of that, the Don Enrique (the future Davao Princess and Iloilo Princess) was already holding that route. She was then assigned to the new Manila-Estancia-Iloilo-Zamboanga-Cotabato route of the company. In 1988, the new Cotabato Princess arrived and she was relieved from that route and she was assigned the route vacated by the loss of the Dona Paz, the Manila-Catbalogan-Tacloban route and Manila-Tacloban route. On October 23, 1988 while there was a typhoon brewing, the Typhoon “Unsang”, Dona Marilyn tried to hightail it to Tacloban when the storm was already off the coast of Samar island on the way to Bicol. “Unsang” was a fast-gaining storm in strength and the ship being new in that area maybe did not know how fast the seas there can become vicious in so short a time (even squalls there can be dangerous for smaller crafts). The ship was swamped by the seas that gained strength from Signal No. 2 to Signal No. 3 and she listed and capsized some 5 nautical miles off Almagro island which is part of Western Samar. Only 147 people managed to survive the tragedy and some 389 people perished.